Without a doubt one of the most exciting ways to explore a new country is to go camping and Slovenia is an ideal camping destination! An almost perfect climate means great camping weather is (nearly always) guaranteed and there’s an awful lot of attractions to visit. To help you plan your camping holiday in Slovenia, we've gathered all the important information about camps and camping rules in Slovenia. Camp your way through Slovenia! Where to camp in Slovenia? You can camp in one of many official campgrounds, which are scattered around the country. A comprehensive and up-to-date list with prices, amenities, reviews and directions can be found here. Campgrounds in Slovenia are generally clean and safe. They are usually located at the outskirts of cities as well as in the green countryside, at the rivers, mountains, lakes and the seaside, where they are particularly suitable for watersports and fishing enthusiasts. All campgrounds in Slovenia are classified into a category of one to five stars - the quality and the number of amenities increase with the number of stars. Campgrounds are a bit pricier than other two options (listed below), but they offer all the luxury you need while on the road (electricity, toilets and showers, hot water, kitchen, camping fire area, wifi etc.). A happy Nest camper enjoying a well deserved shower in an eco camp Korita in Soča valley. If you're willing to splurge a bit more, you can choose among campgrounds that offer much more than just basic amenities – some camps have great things like sports facilities, wellness centres, pools, excursions, jacuzzis, organized activities, bicycle rentals, adrenaline parks, culinary workshops etc. If you're not sure which campground to choose with your Nest campervan, send us an email and we'll be happy to help! If you have a tighter budget you want to stick to, camper stops are the way to go! In 2019, there are already more than 160 camper stops in Slovenia, where motorhomes and campervans are more than welcome to stay overnight for free or for a really small fee. These camper stops offer a cheap and safe overnight spot and sometimes even include an information table about interesting places to discover nearby. On some of these places it’s also possible to fill up your fresh water tanks (0,50€ for 40L), connect to electricity, use the dump station etc. Bear in mind that these camp stops don't offer any additional amenities such as reception, showers, hot water etc. – they are simply nice, well maintained overnight spots. We will also give you a map with coordinates and all the details about camper stops in Slovenia. In addition to campgrounds and camp stops, there is also a network of motorhome stopovers on farms or at friendly inns. This option offers a unique experience as it makes it easy to get in contact with the locals and buy local products. You can for example camp at Kraljev Hrib, a guesthouse in the middle of untouched nature under the Kamnik-Savinja Alp. Great food guaranteed! Agrocamping - a list of 88 camper-friendly farmhouses, you can also download a guide in PDF format! You can find many more friendly stopovers on Google or send us an email and we'll help you! Wild camping, or free camping, is officially prohibited in Slovenia. That doesn't mean nobody does it, but it does come with a certain risk. Camping is regulated by municipality legislation. There are municipalities in tourist areas (with established campings) where wild camping is an issue and they have a legislation about it (alpine resorts, Triglav National Park, the coast). Non-tourist areas have no need for such legislation, therefore if you find a remote spot, there is a chance to camp without consequences. Better to be woken up with a coffee than with a fine! We suggest to camp at any of three camping options listed above or on a private land if you get a permission of the owner. If you're willing to take the risk and camp outside permitted areas, you could face a fine of 83,45€ (or even 100€ in Triglav National Park). During the busy summer months, especially in July and August, we recommend booking campgrounds in advance! Even without booking in advance - worry not, there is always enough camps in the area for you to find a nice spot for your Nest Camper. Camper stops can't be booked in advance, it's first come-first served. Camper stops usually have only few parking stops and we recommend you get there early in the day during the busiest summer days. Campgrounds are usually open from April to October, but there are also some winter campgrounds that are open throughout the year. The best place to check a specific campground is here. Camper stops are open all the time, but bear in mind that winter in Slovenia can be really cold. Really. Cold. We do not recommend camping during winter time if you don't have a heating system in your motorhome or in a campervan. Our Stork Camper has a heating option, but it can only be used while you're plugged to electricity. Can I get any discount for campgrounds? Yes. 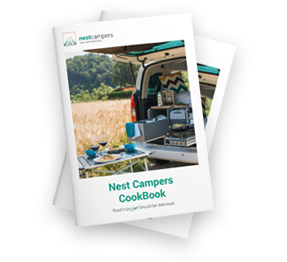 When you book our Nest Camper, you get an electronic - virtual camping card that gives you discounts in more than 100 campgrounds around Slovenia, Croatia, Bosnia and Serbia. The list of all discounted campgrounds can be found here. We’ll send you the card and you can simply save it to your phone or print it. On the check-in just show the card (either virtual or paper one) and sleep a little cheaper! Now all you have to do is book your camper and pack your things.